Edit (2015/01/07): over 20000 visits on Sass Guidelines during the last 24 hours. Thank you so much for your support! I SHOULD WRITE SASS GUIDELINES! — Me, in the shower. 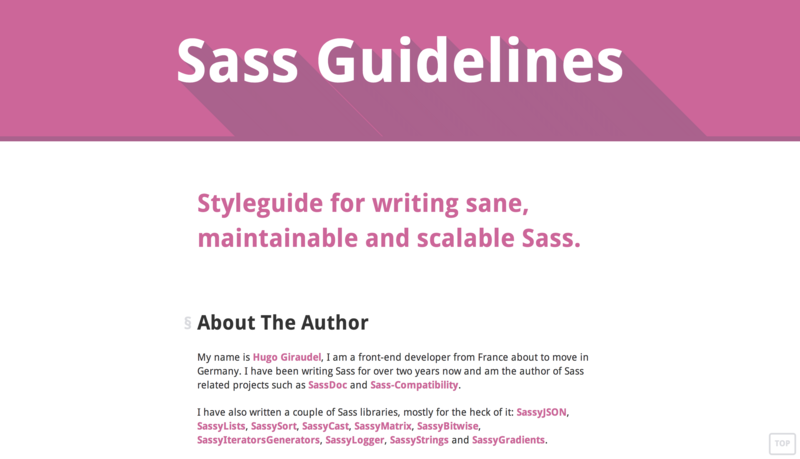 After two days working on them, I am very proud and excited to release a 10000 words long styleguide on working with Sass: sass-guidelin.es. Game on, folks! @SassCSS guidelines, just for you: http://t.co/8ybeXdBOFY. I think we have been on a need for Sass guidelines for months now. Here is my shot at it. However note that this document is very opinionated. This is a styleguide, the styleguide. In it, I tackle almost all aspects of the Sass language: colors, strings, nesting, variables, mixins, extend, warnings, architecture, tools… I may have missed something, but I would be glad to complete it with your ideas. I worked like crazy for two days to have a first version that is good enough to be released. I think I nailed it. Now, we can always improve things. For instance, some people have been complaining about the use of double quotes, which seem to be a pain to type on an american keyboard. Fair enough. I opened a pull request to move to simple quotes instead. Similarly, there is Ian Carrico who seems a bit upset by my agressive no @extend rule. While this is an opinionated document, I feel like I can still round up the edges and make things a little better for everybody so I need to rewrite the section about extending selectors. Also, and I need your help with this, for such a styleguide to make sense, it has to get popular. It has already received some good vibes yesterday thanks to all your tweets (especially CSS-Tricks and Smashing Magazine, let’s be honest). Tweet it, upvote it on Hacker News and reddit and above all: tell me what you think. This is the only way for me to improve it.